Shane Edwards, Mark Edwards and Siobhain Oliver travelled to the South Island and Warrington Beach to compete in the Open Men's events at the BP South Island IRB Championships. They did extremely well, making finals and getting placings. Silver Medal Tube Rescue, Silver Medal Assembly Rescue, Bronze medal Mass Rescue. Sunset Beach were in 8th place with 17 points. Not bad for a one team effort and obviously worth the trip to the South Island. Carolyn Edwards also travelled with the team as an official for the event. Double Gold for Sunset Beach!! The Hipsters competed this weekend in the Northern Region Surf Life Saving Surf Boat Championships at Ruakaka. They competed in the U23 Men's Surf Boat Long Course and Short Course, winning Gold medals for both races. Competing were Ryan Brash, Flynn Avery, Sean Olliver, Xavier Lusby and Mikey Waldegrave (sweep). Well done guys for flying the Sunset Beach flag high at this event. Thank you to the support team and Sunset Beach officials who traveled to the event. 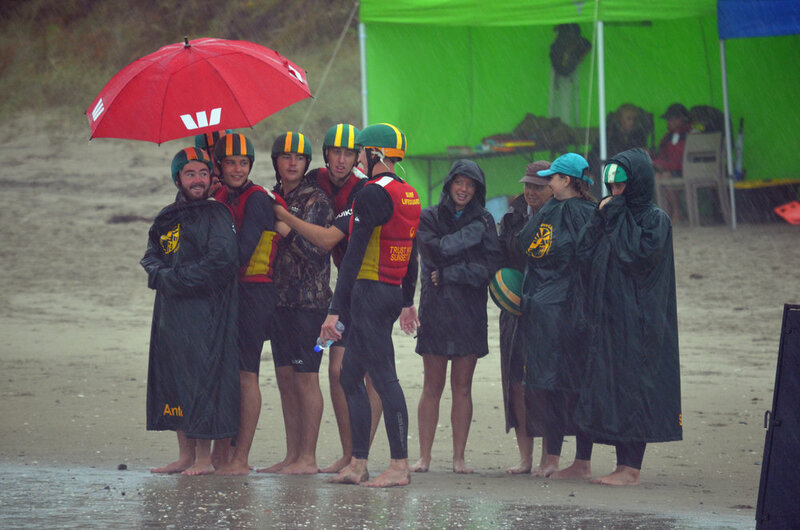 Extremely wet conditions were what faced the competitors at Waipu Cove for the BP Surf Live Saving North Island IRB Championships. The rain was relentless and heavy through to about 2pm when we had some break in the weather… it didn’t stop the racing in these testing conditions. Sunset Beach had 10 teams competing and all teams performed well to add points to the 139 total to put Sunset Beach in 1st place, 50 points ahead of East End on 89 points. Class Act! Taylor Shrimpton and Jemima Ferrier were unbeatable today with 5 gold medals. Other notable performances were Senior Mens - Shane and Mark Edwards who were on the podium for all of their races with 3 silver and 2 bronze medals. U22 Mens – Judd Redmond and Anton Baptist raced extremely well for 1 gold, 3 silver and 1 bronze medal. 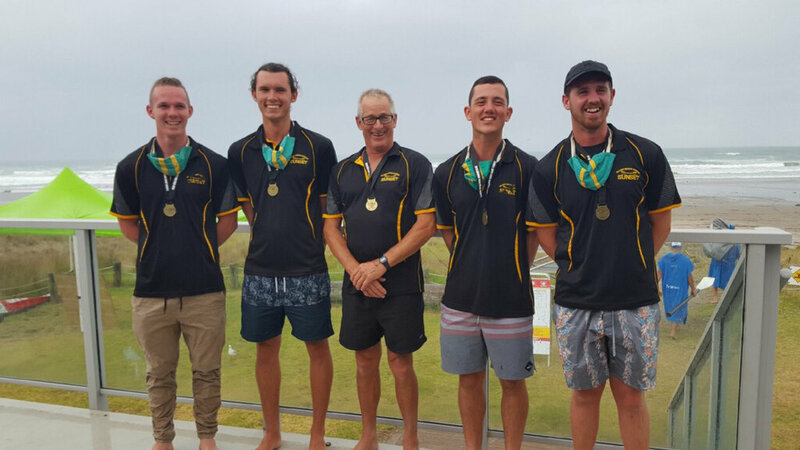 Sunset Beach Lifeguard Service were proud of the performance of our teams for what was a long hard day at the beach and retaining the title for the 3rd year running – Top Club, North Island IRB Championships. Sunset Beach Surf Boat crews could only stand and watch as the huge surf at Waihi Beach was relentless. The only crews to race were the open men's and much later in the day, one final race for 7 women's crews. Yes, they were disappointed but we're happy they're all safe and unharmed. Series medals were decided on points from the last 3 series. Congratulations to 'The Young Guns', Gold medal for winning the U23 Men's Surf Boat Series. Congrats also to the Sunset Hipsters who take out Silver Medal in the U19 Men's. It will be back to the beach Sunday for the Sunset Young Guns who will be representing Northern Region in the Surf Life Saving NZ Regional Surf Boat Challenge. Surf is predicted to be better. Whew! !